Your Secret’s Safe With Gus is a weekly improvised fictional podcast from the Improv in Action Network. In an isolated farmhouse, miles above his secret lair, lives banished superhero Augustus “Gus” Galilei who fills his days inventing and experimenting alongside his battle android Chester. When his estranged daughter, Viola, arrives, needing his help, Gus must seek assistance from a manny named Chris, their Smart House “SV3DVAHF,” and the occasional visitor. Can Gus help his daughter ... See More face her fears and restore their relationship? Join us through tears and laughs as Gus slowly opens himself back up to the world through the comfort of the expansive mysteries of the levels deep below. 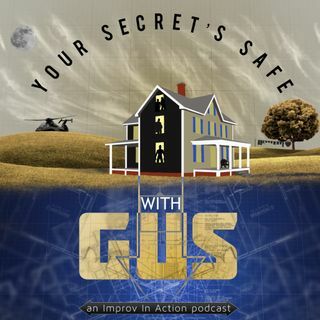 You can subscribe to Your Secret’s Safe With Gus for free on iTunes and Stitcher, Improvinaction.com or wherever you get your podcasts.